The NON-quality's costs: if you know them (maybe) you avoid them. Blulink Seminars and Conferences 2018 The NON-quality’s costs: if you know them (maybe) you avoid them. The NON-quality’s costs: if you know them (maybe) you avoid them. Process by process, area by area, in the company and with its own customers and suppliers, a new mission for Quality: ensuring the right ideas to identify, isolate and mitigate wastes and gaps in the Products and Services’s quality. The potential of Quarta®3 as support tool. Blulink invite you to the Seminar, that will take place 20th march form 9:30 am to 1:00 pm, @ TheNicePlace, a new area, about over 3.000 mq nearby Nice S.p.A.’s Headquarters, an area completly dedicated to the meeting, exchange, sharing and generation of knowledge. 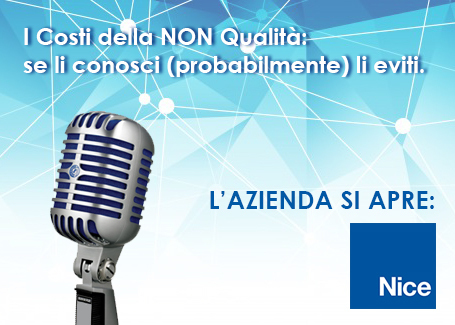 Marco Bianchet, Group Quality Director, Nice S.p.A., he’ll tell us how Customer’s Quality and Supplier’s Quality. Nice is a Blulink customer from 2007 and it is a global leader in the Home and Building Automation. Enrico Zanolin, Industrial Engineer di TEXA S.p.a. is a customer of Link Management e Blulink from several years, with Link Management Texa manage the MES (Manufacturing Execution System). The detection process involves production’s data in order to elaborate perfomance’s indicators in real time as the OEE, but also process’s data in order to define each single Serial Number with supplier’s lot or other internal productions. Texa with Blulink manages quality’s controls and relative Problem Solving’s processes. Presentation of the implementation of the Quarta®3 solution inside Ognibene Power, global market leader in the power steering system off-highway sector. Discover how face up to the NON-quality’s costs, book your place!